Energise and restore your mind and body with a yoga class at Wooda Farm Holiday Park. Every Wednesday morning throughout peak season 10am- – 11am. Enjoy morning yoga sessions at Wooda Farm Holiday Park that gently awaken your soul leaving you ready for the day ahead. 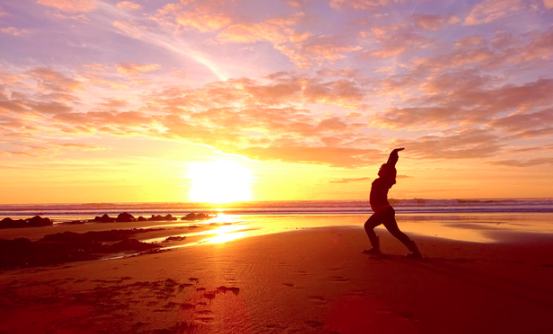 Gaze at the stunning seaviews across Bude whilst yoga teacher Claire, takes you on a journey to restore peace and calm both mentally and physically. Classes are a wonderful way to leave the stresses of everyday life behind and ease into your Cornish holiday. Perfect for beginners or the more experienced yogis, find your inspiration to stretch and breathe as you move and flow in unison with the breath. Claire teaches "Chi Yoga” incorporating both traditional yoga postures with Qi Gong the foundation of Tai Chi, combining both disciplines helps to create a deeper inner harmony. Book Your Place: Pop into reception or call 01288 352069. All equipment is provided. Children over 12 years old are welcome. Don't forget to bring a drink with you! Book a private one-on-one session or a small group session where you can bring a sense of calm and stillness to your body. Sessions can be held on the beach, in the woodland or within your accommodation.